The first time I saw the original version of this cake, it was in a magazine. It was a gorgeous, elaborate cake with fresh peaches, ice cream, pound cake and whipped cream. It seemed like such a perfect summer treat. Who doesn’t want ice cream cake on a regular basis, but especially during the summer? After going over all the ingredients and process of the recipe, I decided to revise it to make it easier. Pureeing a can of peach pie filling is much faster, especially when little ones could be tugging at your clothes wanting yet another snack…because the first 5 things they ate weren’t enough. 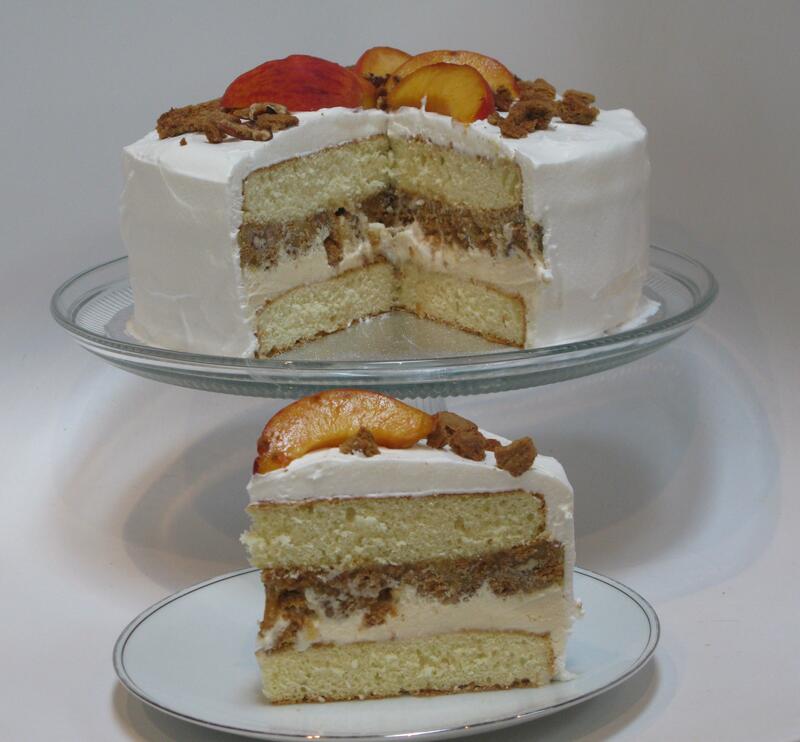 Combining the graham cracker mixture with the peach puree gave it more texture, and the added crunch in the cake just added a little more appeal to it. It was such an incredibly creamy blend of the peach flavor with the softened ice cream, with that added crunch and the pound cake with whipped cream. My mom was disappointed that we didn’t pack it up in the car the next day and bring it with us to the beach, but I honestly can’t think of how it would have survived a 3 hour trip. Bake the pound cake according to directions on the box in two 9 inch round cake pans. Cool in pans on cooling rack for 10-15 minutes, turn cakes out on cooling rack to cool completely. Puree the peach pie filling in a blender, transfer to a bowl and freeze until thick, about 1 hour. Lightly crush graham crackers, place in a bowl. Add melted butter, pecans, and brown sugar, toss to coat. Spread on a cookie sheet and bake at 350 degrees for 5-7 minutes. Coat a 9 inch springform pan with cooking spray and line the bottom and sides with plastic wrap, leaving a two inch overhang. Place 1 cake in pan, then spread softened ice cream on top of cake into a smooth layer. Sprinkle graham cracker and pecan mixture on top, reserve a small amount for garnish on top of cake. Top evenly with the peach puree. Place other cake layer on top, cover with plastic wrap and place in freezer to set at least 6 hours or overnight. Uncover the cake and invert onto a plate, remove the springform ring and the plastic wrap. 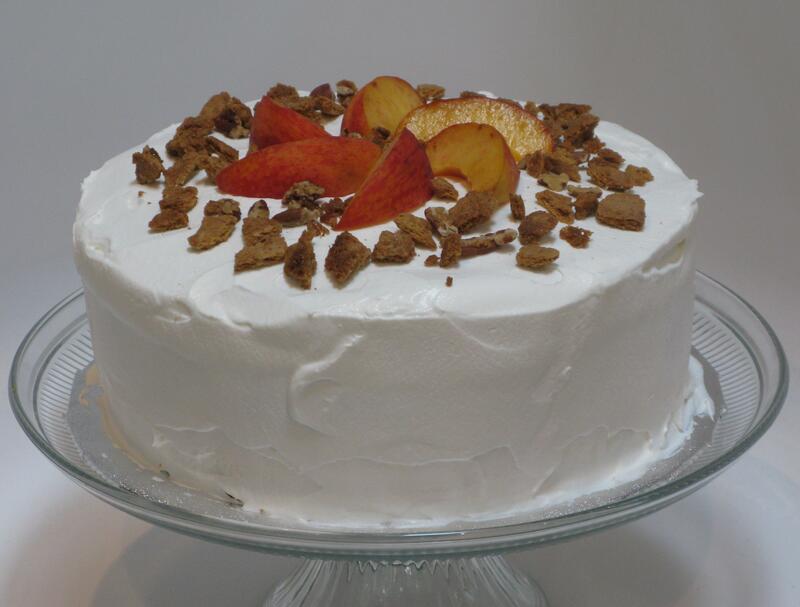 Cover the top and sides with the whipped topping, top with sliced peaches and chopped pecans as a garnish. Freeze until firm, about 1 hour.